The wood frame organizer has 12 plastic bins of varying sizes to keep everything tidy. 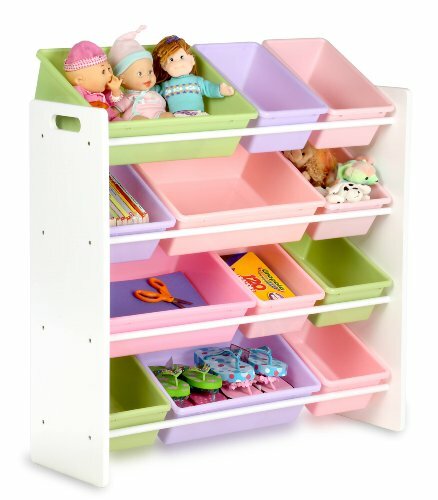 It is the perfect organizer for playrooms, bedrooms, even their bathroom! The colorful bins make organizing fun and easy. The casual combination shelf/storage bins are made with four fixed shelves and 12 bins. The frame features storage compartments, open back, steel shelving rods and durable metal hardware. Some assembly is required but will last so long, your children will outgrow it! Stands almost 3 feet tall, about 3 feet wide and 1 foot deep. Features: removable containers make for quick clean up, durable and stain resistant surfaces, rounded safety corners, thick plastic and helps develop organization skills. Size: 36"H x 33.25"Wx 12.5"D. Four deep plastic bins measuring 16.25" x 11.75" x 5". Eight deep plastic bins measuring 11.75" x 7.75" x 5".